CAMPGROUND CLOSURE Due to campground reconstruction, all reservations are closed through December 31, 2019. We will keep you up to date on our progress and any changes to reservation status. 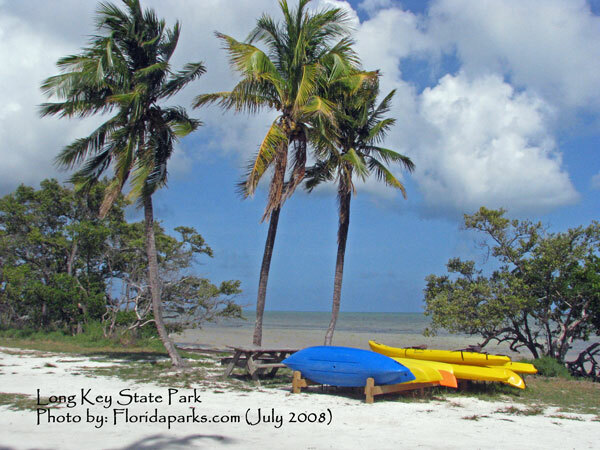 Welcome to Long Key State Park and the fabulous Florida Keys, where the water is warm and the weather is amazing! Long Key offers great flats fishing with hiking and great Kayaking. Picnicking Picnic areas are available with a scenic view of the Atlantic Ocean. Canoeing One of three nature trails in the park, the Long Key Lakes Canoe Trail provides visitors with the opportunity to enjoy a leisurely “paddle” through the park’s shallow water lagoon. Canoe rentals and a self-guided brochure are available for this hour-long journey. Fishing Some of the best sport fishing in the Florida Keys are popular year-round. Saltwater fishing licenses are required in Florida. Full Facility Camping There are 60 full-facility campsites in the park, all overlooking the Atlantic ocean! Each campsite comes equipped with a picnic table, ground grill, water, and electricity (extra charge). Three, nicely tiled restrooms with hot showers, are centrally located. Also provided, is a dump station for gray and black water. Reservations may be made up to 11 months in advance. The sites book quickly so make your plans well in advance.